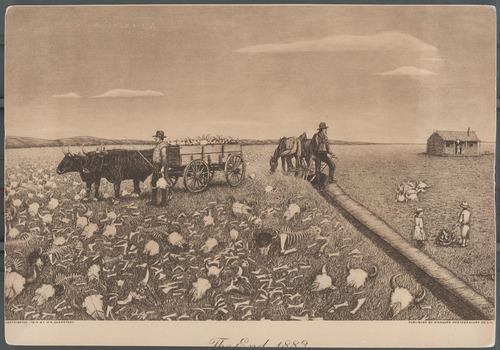 This ink on paper drawing by Martin Garretson depicts the artist's conception of the changes in western Kansas as the open prairie was claimed for family farms. By 1883, the vast buffalo herds of the central plains had been hunted almost to the point of extinction. In the drawing, one man is shown loading bleached buffalo bones into an oxen-drawn wagon, while another man with a horse-drawn plow has begun plowing the cleared prairie for a farm crop. A young girl and boy are shown with piles of horns and horned skulls, and a woman is shown standing in the doorway of a small farmhouse in the background. This demonstrates to students how, by the 1880s, there were few live buffalo because so many had been killed off. It gives the end of the story about the depletion of buffalo, working with documents and photographs that discuss buffalo hunting.